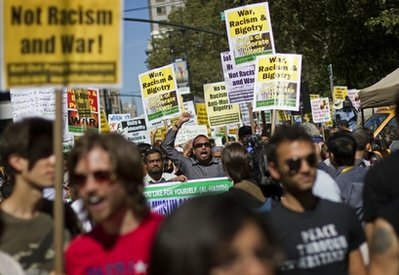 The demonstration dwarfed the smaller right-wing, racist mobilization that was organized in opposition to the planned construction of an Islamic Community Center several blocks from the site of the former World Trade Center in lower Manhattan. Today’s demonstration was organized by a broad coalition of progressive, anti-war, Muslim, Arab American, South Asian and social justice organizations from the Black, Latino and Asian communities. The ANSWER Coalition organized its members and supporters to join this important mobilization against racism and Islamophobia. Speakers at the demonstration included Ramsey Clark, Cynthia McKinney, representatives of the International Action Center, December 12th Movement and others. It is critical for the anti-war movement and all people of conscience to stand together in defense of the Muslim community, and in opposition to racism and war. The ANSWER Coalition is organizing people from all over the East Coast and Midwest to participate in the Stand Up-Fight Back contingent at the Oct. 2 mobilization in Washington, D.C. Click here to sign-up to join the contingent. The Oct. 2 mobilization will draw together hundreds of thousands of working people who will demand jobs, peace and justice.